Good Monday morning…another hot day expected in the area today as clouds out west are thinning as they come eastwards…yesterday Downtown KC hit 100° for the 4th time this year…KCI fell a few degrees short (97°). Today will be about as hot I think as long as the western clouds keep thinning as they move our way. If they are a bit thicker and filter out the sunshine more…it may be a few degrees “less hot”. A cold front to the north of the region will remain the key to the rain chances…and obviously we need the rain as many areas are running about 50% of average for moisture amounts so far this year. Tonight: Showers and storms likely overnight into Tuesday. 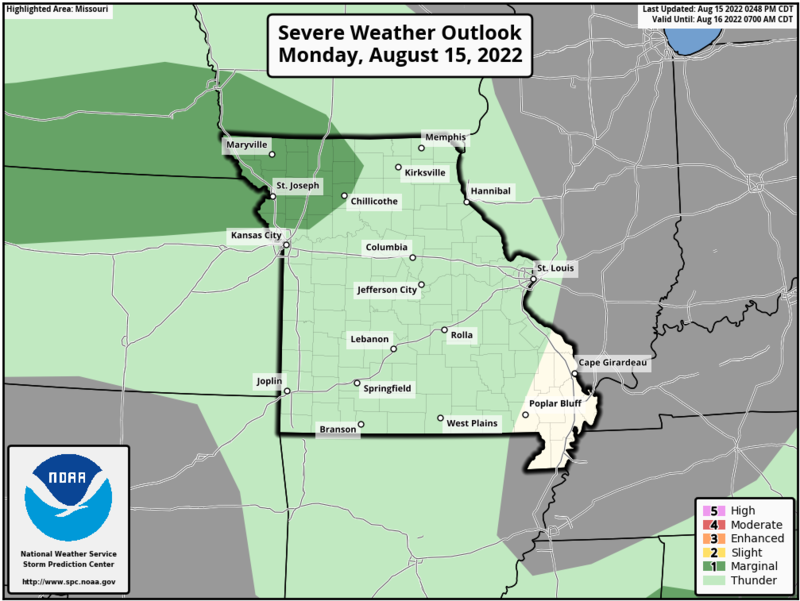 Some locally heavy rains are possible with even a chance of a few near severe storms across northern MO. Winds are the main threat. Lows around 70°. The afternoon data however isn’t too convincing on getting a lot of rain in the KC Metro area…there should be something in the morning BUT right now it looks very disorganized and not that widespread in terms of amounts of significance. IF you get 1/2″ consider yourself lucky at this point. Tuesday: The highest chances are going to be during the 1st part of the day…with maybe a few stragglers in the afternoon. Highs will be much cooler…and depending on the clouds…may only be in the 70s. For now lets keep the 80-85° highs. Rain totals be in excess of of 1″ in some areas…and perhaps more for the lucky ones…this afternoons data does favor northern MO as being the more likely area to be getting the more beneficial rains…really however it may be southern IA that gets the best rain out of the activity overnight into Tuesday. There hasn’t been a lot of change in the data today compared to yesterday…perhaps some beefier totals being spit out for rainfall amounts, which given the deficits, would be great for that to be realized. Thee cold front oozing southwards will be the key…with perhaps the best rains coming behind the front…as a disturbance or two comes along the I-70 corridor…and helps in getting the air to start lifting over the front…and generating more rains on Tuesday morning. The morning weather map shows our front towards the NW of the KC region…it will only slowly sag towards us today and tonight. The dew points at the surface have been creeping up and today will actually feel more muggy compared to the the past week to 10 days or so…so combined with highs well into the 90s…add another 5° to the temperature for the heat index number. I’ve sketched in the thicker gulf air towards the Gulf Coast area into the western TN Valley. Also note the numbers in RED in the Plains…those are the temperatures and the air is cooler, not that unusual though, across NE and points north. One of the many complicating aspects of the forecast, aside from how the temperatures will be affected by the clouds today…is the leftover impulses towards the central KS area…wandering eastwards. I mentioned yesterday that I wouldn’t be shocked IF there were a few showers or storms during the day today…and that is still the case. Certainly not enough to warrant cancelling any plans or anything. Be aware, especially after 4PM or so…for maybe some spotty storms…the front though will still be well NW of the KC area by then. Meanwhile I’ll add in the local radar from Pleasant Hill. So our short term models may be helpful today…let’s see about the convection that they’re trying to pop later this afternoon…it will be rather hot for sure…so there will be some instability. We have a “marginal” risk of severe storms in the region. IF a storm can get it’s act together later today and this evening…strong winds seem to be the main threat. The atmosphere below 10,000 feet though is pretty dry (aside from the somewhat muggy air at the surface) so it’s not the greatest set-up. The front itself will wander southwards tonight…and slowly push towards the I-70 corridor. It really won’t get south of the area till sometime later tomorrow. The hope, to add some needed bonus rains to the gauges in the region…would be for a disturbance or two to come eastwards to the north of the surface front and allow additional rains to move west to east through the area through the 1st part of the day. That would be the key really to getting something a bit more widespread and beneficial. Again VERY likely this isn’t a widespread event…then again we usually DON”T get widespread events in August. Some areas though should do OK with this set-up. Here is the HRRR model…if there is a data issue…here is the link from IA State. So of our higher resolution model data has amounts overall from a few hundredths to over 2″…about right considering the nature of the storms in the region. IF you get thunderstorms…the amounts will be higher because of the downpours. Here is a look at the forecast rain totals off the high res NAM model. Notice how the amounts vary from one part of a county to another…from very low to rather significant (over 2″). I’m NOT comfortable with the location of the higher end max bulls-eyes but it does show potential and that’s the important thing. It’s jut a matter of who is impacted by the thunderstorms the most…and since those are still hours from forming…you get the idea. FWIW…this model has highs tomorrow from the mid-upper 70s to the upper 80s to near 90° within the KC metro area on Tuesday…and as a result pops some additional storms later in the heat and humidity in the afternoon on Tuesday. a trend worth watching, especially on the MO side towards the SE of the KC Metro area. Our feature photo comes from ‎Joan Buie Thornbrugh‎ up towards Lawson, MO of a pretty sunrise from yesterday.